Chicken nutrition: what do backyard chickens eat? The foods you should be feeding to your backyard flock - and some you should steer clear of. Confused about which foods your chickens should and shouldn't eat at different times of year? I remember being completely confused about their nutritional needs when I was first starting out with my backyard flock. I wrote these pages in the hope that they would help prevent you from being as confused as I was, and to keep you abreast of any developments in research and experience. Use these links to find what you're looking for more quickly. No time to read now? Pin to read later! 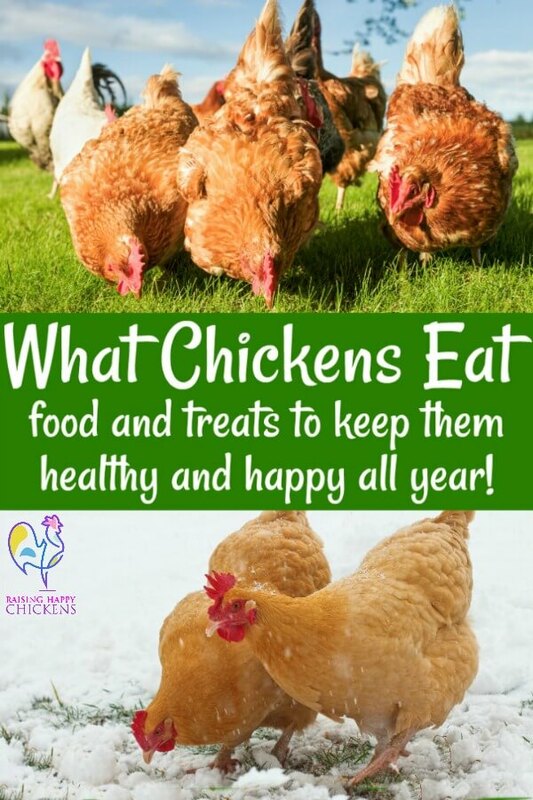 My articles will take you through the best nutrition for your chickens at all the key points in their life from newly hatched to adult breeding hens and beyond. They also cover how food and treat needs vary from one time of year to another. Just click on either the headline or the pic for each different subject to go straight to that page. Section 1: Basic foods and how to feed them. Which basic foods should chickens eat? 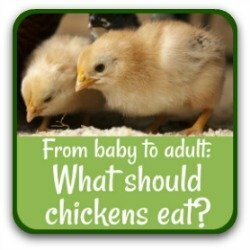 Confused about what your chickens should eat and at what age? Hens and roosters need different nutrients at different times in their life, and feeding the wrong balance can seriously affect their health. This article describes what a chick should eat from point of hatch right through to adulthood. 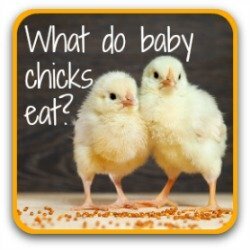 A detailed article about what baby chicks should be given to eat, from hatch to 8 weeks old. It also covers what's a good food for chicks who need that extra bit of help. 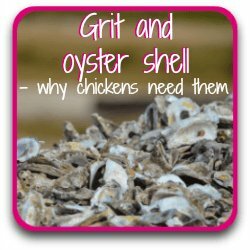 Did you know that grit and oyster shell are both critical to your chickens' health? If you give one do you still need to give the other? What happens if your chickens don't eat therm? Do roosters need them? And chicks? This section is written to answer those questions for you as simply as possible so that you have a clear idea of what supplements should be given, when. 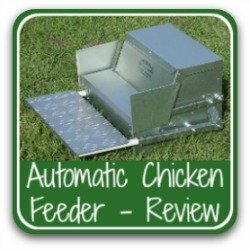 Best automatic chicken feeder - a review. Working out what chickens eat is your first step. Working out how to feed it is next. Grain is a sure way to invite unwanted guests into the coop. Wild birds and rodents will come wherever there is available food. Both will bring disease to your coop and your home. The answer is a feeder which is rodent-proof and not open to the elements. Grandpa's feeder is the best to fit the bill. Five healthy treats your flock will love to eat! Chickens should be fed treats only as part of a well-balanced diet. But how to know what's good for your flock and what's not? 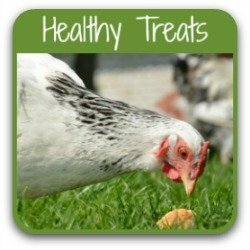 My guide to ten of the healthiest treats for your poultry starts here, with the first five. It describes what's good and why and gives advice about when treats can be given, when they should be given and when they should be avoided. 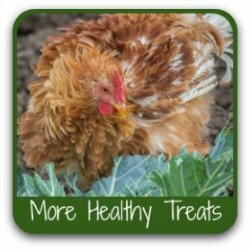 Five more healthy treats for happy hens. This page looks at the benefits of five more healthy treats. The benefits and the potential problems of flowers, lettuce, melon, pumpkins and tomatoes are all dealt with in detail. You'll always be sure you're giving your flock only the best of all possible treats. 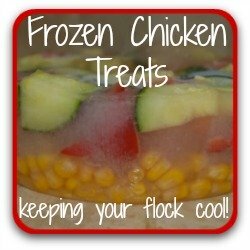 How to make a frozen chicken treat. Kids love to do this! And frozen treats can literally be a life-saver, avoiding dehydration and heat stress. Filled with goodies they love, these iced delights thaw gently as they melt in the heat. Inexpensive and easy - a real summer boon. 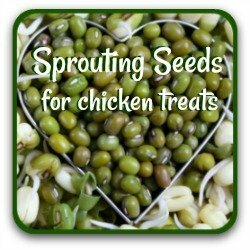 Sprouting seeds for chicken treats! Antioxidants, proteins, vitamins - add water for powerhouses of goodness for your flock. So simple to do, such a great benefit for your chickens' health. And here's another benefit - they're just as good for humans, and delicious in salads. 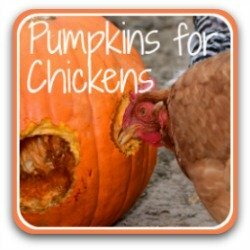 Chicken health benefits of pumpkins. Vitamin A, Vitamin E, potassium, zinc - pumpkins and their seeds are a healthy source of vitamins and minerals for chickens - and they're low in fat. Stored for all-year feeding, they're particularly good for laying hens in Spring and for a healthy winter treat. Includes a recipe for a poultry pumpkin cake! Section 3: High Protein Treats. When should your flock eat high protein foods? Which are good for your hens and why is it possible to "kill them with kindness"? 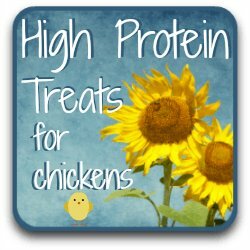 My list of ten high protein treats comes from proven research about the most effective ways of helping chickens through the hard times in life. 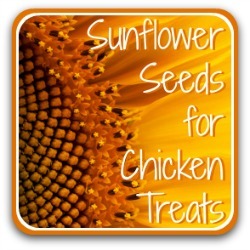 Sunflowers: fields of yellow in the summer, and in the autumn, healthy, high protein treats for your flock. This article looks at the nutrition in sunflower seeds, and which type is the best for your flock. It considers the best varieties to grow for the highest yield of seeds, how to plant and when to harvest to make sure of the highest levels of oil. It's good fun to put some high protein foods together to help chickens through moulting or to give them a boost during the winter months. This recipe will help give you an idea of the kinds of quantities you'll need for your own flock, big or small, and explains why the ingredients are there. 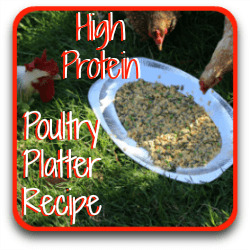 Take this as a base and then - experiment until you find the perfect recipe your hens will love to eat! Fermented food: what it is and why it's good for chickens. 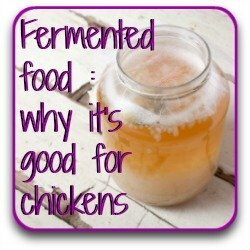 If you're not sure what fermented food is or why it's good for your hens, this article will help. It discusses whether introducing bacteria into food can be healthy, how it helps increase resistance to illness and disease, and whether there are any drawbacks. If you've never tried fermenting chicken food before, you'll want to after this! Section 4: Foods to avoid. 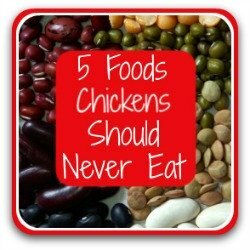 5 foods your chickens should never eat. So you know which foods your hens should eat - but do you have any idea about those which could prove fatal? These five could - and they are commonly available. It would be very easy for you to give these foods without realising the harm you're doing. Don't risk letting your hens eat anything poisonous. Find out what you should be avoiding at all costs.